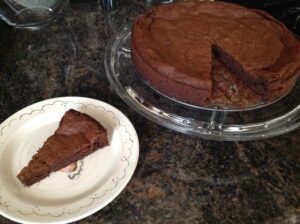 Posted December 17th, 2013 by Lisa & filed under 12 Divine Holiday Treats, almond meal, chocolate, Christmas, Divine Chocolate, flourless chocolate cake, Gluten-Free Goodness. A torte by any other name is…a cake? That’s right, “torte” may sound fancy, folks, but it’s really just a decadent, rich, delectable cake. 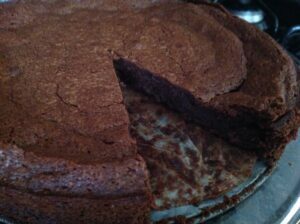 I’ve made a few flourless chocolate cakes in my time, and I’ve yet to bake one I didn’t thoroughly enjoy. True story. 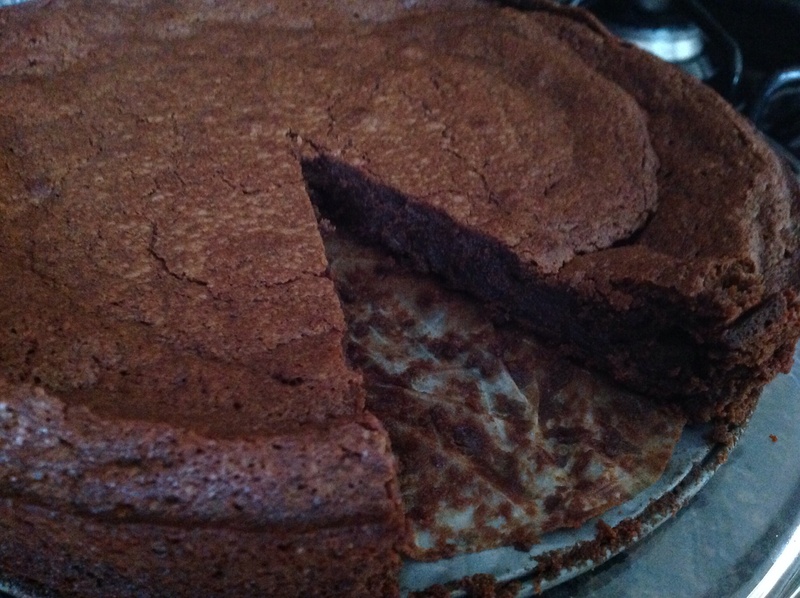 This Flourless Rich French Torte is no different. With the texture of a gooey brownie and rich chocolate flavor, the recipe for this cake is quick, easy and perfect for entertaining a holiday crowd. Added bonus: If you’re hosting gluten-free revelers, it’s a great treat! As the name suggests, there’s no flour — it’s replaced with almond meal, which is naturally gluten-free. 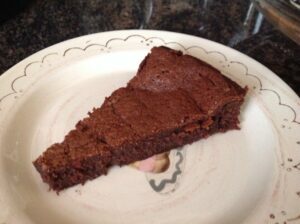 You may opt to serve this cake as is (seriously, I couldn’t wait to eat it straight out of the oven!) or top it with a light dusting of powdered sugar. Want to be more creative? Take a paper snowflake doily, place it on the completely cooled cake and sprinkle powdered sugar over the top, carefully removing the doily to reveal a beautiful and festive design. No matter how you slice it, this dessert is simply divine. 1. Preheat oven to 350 degrees. Grease and line a 9-inch springform tin. Break up the chocolate, put into a large heatproof bowl with the diced butter and melt gently. Remove the bowl from the heat and leave to cool until needed. 2. Beat the egg yolks and both sugars with a whisk until light and fluffy. Gently stir in the cooled chocolate mixture and ground almonds. 3. Whip the egg whites until stiff. Gently fold the whites into the chocolate mixture in three batches. Spoon the batter into the prepared tin and spread evenly. 4. Bake for 30 minutes or until the center is barely set. Remove the tin from the oven and let cool on a wire rack for 15 minutes, then carefully remove the torte from the tin. Dust with icing sugar and serve just warm or at room temperature. Best eaten within 2 days.